Pluto, oruko 134340 Pluto, ni planeti arara to ni akojojulo keji ninu Sistemu Orun (leyin Eris) ati isupo agbarajo kewa to je sisakiyesi pe ohun lo lojuonaiyipo taara Òrùn. ↑ Escape velocity derived from the mass m, the gravitational constant G and the radius r: Àdàkọ:Math. ↑ 4.0 4.1 4.2 4.3 4.4 4.5 M. W. Buie, W. M. Grundy, E. F. Young, L. A. Young, S. A. Stern (2006). "Orbits and photometry of Pluto's satellites: Charon, S/2005 P1, and S/2005 P2". Astronomical Journal 132: 290. doi:10.1086/504422. Àdàkọ:Arxiv. http://adsabs.harvard.edu/cgi-bin/nph-bib_query?bibcode=2006AJ....132..290B&db_key=AST&data_type=HTML&format=&high=444b66a47d27727. ↑ Calvin J. Hamilton (2006-02-12). "Dwarf Planet Pluto". Views of the Solar System. Retrieved 2007-01-10. ↑ "AstDys (134340) Pluto Ephemerides". Department of Mathematics, University of Pisa, Italy. Retrieved 2010-06-27. 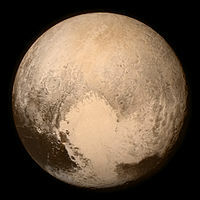 ↑ "JPL Small-Body Database Browser: 134340 Pluto". Retrieved 2008-06-12.